↑ "2013 Grammy Nominations". MTV. December 6, 2012. Retrieved December 6, 2012. ↑ "Grammys 2013: male artists lead nominations". Guardian UK. London. December 6, 2012. Retrieved December 6, 2012. ↑ Lewis, Randy (February 11, 2012). "Grammy Awards 2013: Mumford & Sons' 'Babel' wins album of the year". Los Angeles Times. Retrieved February 11, 2013. 1 2 3 4 "Grammy Awards voters spread the love all around". Associated Press. February 11, 2013. Retrieved February 11, 2013. ↑ Keller, Emma G; Braiker, Brian (February 11, 2012). "The Grammys 2013 – live coverage of the 55th annual music awards". Guardian UK. London. Retrieved February 11, 2013. ↑ McCormick, Neil (February 11, 2012). "Grammys 2013: Mumford & Sons steal America's thunder". Daily Telegraph. London. Retrieved February 11, 2013. ↑ "The Recording Academy Announces Board Of Trustees Meeting Results". 1 2 3 Kennedy, Gerrick D. (February 5, 2013). "Grammys 2013: Pre-telecast to stream live from Nokia Theatre". The Los Angeles Times. Tribune Company. Retrieved February 9, 2013. 1 2 "Twenty-time Grammy® Winner Bruce Springsteen to be honored as the 2013 MusiCares® Person of the Year". ↑ "Artist Erika Iris Simmons Creates Official Artwork For 55th GRAMMY Awards". The Recording Academy. November 30, 2012. ↑ "Who's Performing On The GRAMMYs?". Grammy.com. The Recording Academy. February 7, 2013. Retrieved February 8, 2013. 1 2 3 "Kelly Clarkson, The Black Keys, more warm up for 55th Grammy Awards". The Tennessean. Gannett Company. February 8, 2013. Retrieved February 8, 2013. ↑ "EXCLUSIVE: Miguel And Wiz Khalifa Will Collaborate At The GRAMMYs". Ryan Seacrest. Retrieved February 7, 2013. ↑ McKinley Jr, James C. (February 8, 2013). "Ken Ehrlich, the Man Behind the Grammy Awards Show". The New York Times. ↑ "Rihanna Nabs 2013 Grammy Awards' Very First Prize - Music, Celebrity, Artist News". MTV.com. February 10, 2013. Retrieved February 14, 2013. ↑ McGovern, Kyle (February 8, 2013). "Grammys 2013 FAQ: Everything You Need to Know About Music's Biggest Night". Spin. Buzz Media. Retrieved February 9, 2013. ↑ "Bruno Mars, Rihanna And Sting, And Kelly Clarkson To Perform On Music's Biggest Night". Grammy.com press release. February 4, 2013. Retrieved February 7, 2013. ↑ "55th Grammy Awards Nominees". Retrieved February 10, 2013. 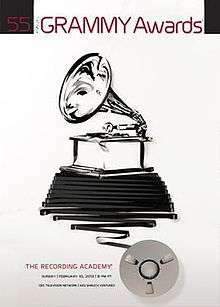 ↑ "2013 Grammy Awards Winners: The Complete List". E!. February 10, 2013. Retrieved February 10, 2013. 1 2 3 "The Recording Academy Announces 2013 Special Merit Awards Recipients". National Academy of Recording Arts and Sciences. ↑ Chilton, Martin (December 6, 2012). "Grammy Awards 2013: Rich pickings among 81 awards". The Telegraph. London. ↑ Kondolojy, Amanda (February 12, 2013). "Sunday Final Ratings: 'Family Guy' & 'The Cleveland Show' Adjusted Up; 'The Simpsons', '60 Minutes' & 'Revenge for Real' Adjusted Down". TV by the Numbers. Retrieved February 12, 2013.